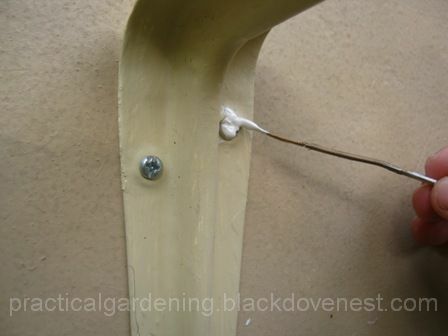 In a past article, this gardener discussed a simple, yet functional, wall-mounted homemade bracket for garden hanging baskets. 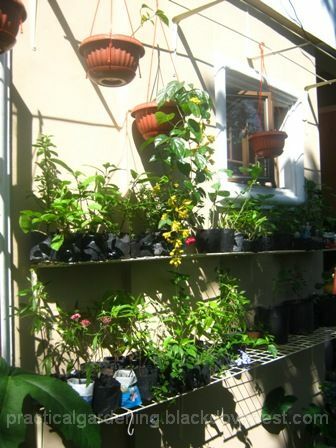 However, as more cascading garden plants were grown, more plants in hanging garden pots were needed to be displayed. Numerous individual garden support brackets weren't practical nor space efficient. 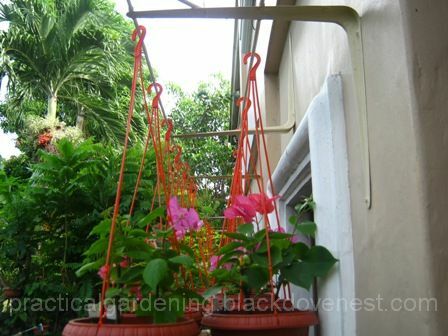 An overhead garden rod for hanging garden pots would prove to be a viable solution for hanging baskets lined up in a row. This article discusses a homemade gardening project where 2 overhead rods may be suspended by support brackets. 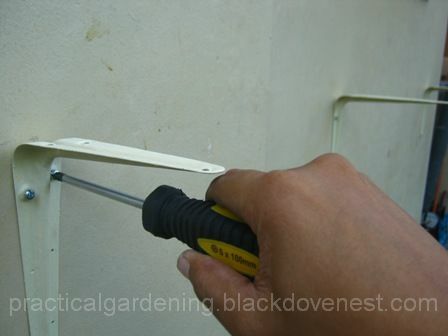 Unlike the garden DIY project in the past article, no screw hooks and nuts will be used. Instead, rebars or reinforcing bars will be used as the garden rods. The two rods could accommodate the small hanging 8-inch baskets lined up in two rows. 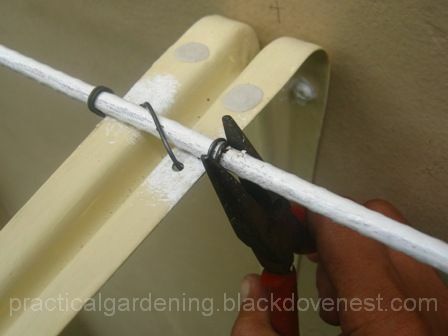 This homemade garden support rod assembly can be mounted on any flat concrete wall or fence structure. The materials used are readily available at hardware and construction supplies stores. 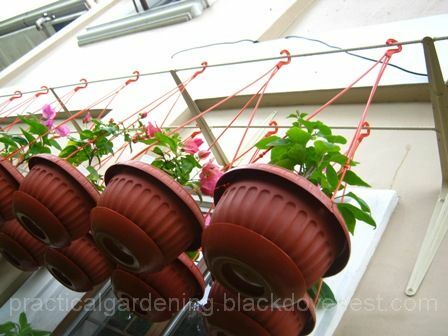 The mounted assembly can support two rows of the small garden hanging pot. If garden hanging pots of bigger sizes are used, or if plants of larger foliage are grown, then the gardener as the option of skipping the inner rod and just use the front or outer rod instead. 9mm Rebar (reinforcing bar) - 76 inches, 2 pcs. Metal screws with expansion shields or raw plugs - #6, 12 pcs. Power drill with 1/4" masonry drill bit and 1/8" metal drill bit. Prepaint all 4 brackets and the 2 rebars an oil-based paint. Oil-based paint is weather-tough and durable. Prepainting the brackets and rebars is better than painting them when everything is already assembled and mounted. This is because it's easy to miss a spot. Drill two 1/8" holes halfway the length of the 14-inch side of the bracket. That means 7" from the front end of the installed bracket. This is where the 1st rebar will be positioned across the 4 brackets. Mark 4 points horizontally on the wall where the 4 support brackets of the garden rod assembly will be positioned. The 4 points on the imaginary horizontal line are 24 inches away from each other. A distance longer than 24 inches may cause the rebar to sag when multiple hanging baskets are hanged from it. Ensure the line is horizontal by using a carpenter's level. With a power drill, drill all the screw holes for the 4 brackets on the 4 marked points. Each bracket will usually have 3 screw holes for mounting. Here's a tip to drill holes with correct depth. Insert the expansion shields in the drilled holes and screw in the metal screws with a Phillips-type screwdriver as shown below. Paint the newly set metal screws with the oil-based paint for extra protection. Use a piece of wire, rather than a brush as shown below. Place the 1st rebar on top of the 4 mounted brackets and position it halfway the length of the brackets' top (where the two 1/8" holes have been drilled). 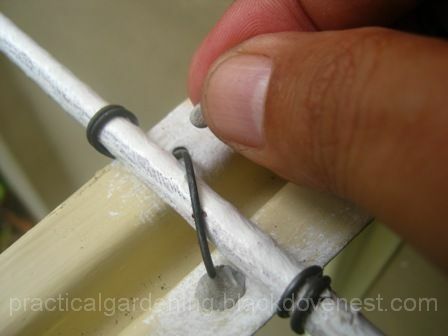 Attach the rebar to the bracket's 2 drilled holes by using pair of pliers to wind a piece of metal wire. Do this for the 4 brackets. Plug the bracket's two holes where the wire went through with clay epoxy. Clay epoxy helps keep out water which may result in rusting. Do this for the 4 brackets. Place the 2nd rebar on top of the 4 mounted brackets and position it towards the front. Attach the rebar to the bracket's front hole by using pair of pliers to wind a piece of metal wire. Do this for the 4 brackets. As with the 1st rebar, plug the front hole of the 4 brackets with clay epoxy to prevent rusting. Shown below are the 2 rebars properly positioned and attached to the 4 brackets. The entire overhead garden rod assembly has been repainted to match that of the wall color. There may be cases where pieces of rebars are cut short and need to be joined. There's a tip in this article where cut rebars may be safely joined in the assembly. Prepaint as much hardware as possible. It's easy to miss spots if painting is done when everything is installed. Cover all hardware with paint or clay epoxy to help prevent rusting. If bigger hanging baskets are used, then omit the inner rod and just use the front or outer rod for a one-row display. Ditto for garden plants with big foliage. Here's an overhead view of the garden rod assembly showing two rows of garden hanging baskets. 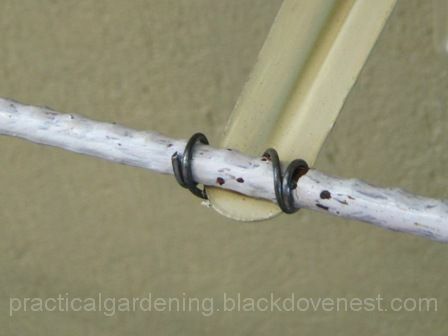 Right-side and eye level view of the garden rod assembly for hanging baskets. The plants shown in the garden hanging baskets are flowering Bougainvilleas. 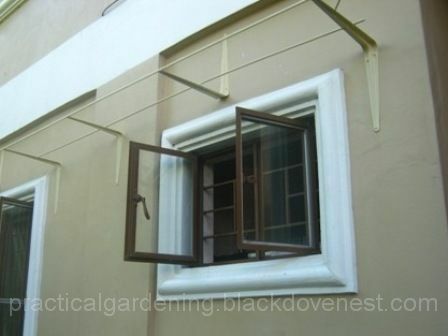 A couple of homemade garden nursery racks may be incorporated below the hanging rods on the wall as shown below.